I've made another quick card with a Paint Chip base from my recent trip to the Hardware store. These cards are so easy and quick but the look is effective. This one uses a Mauve coloured paint chip and the Blooming with Kindness and Label Love stamp sets. The cardstock used is Basic Black and Crumb Cake with Whisper White used only to stamp onto for the greeting. Here's a closer look at that greeting. The Label is actually punched twice with the Artisan Label punch, once for the greeting and once for the Crumb Cake mat then raised onto 3d foam. The corners of the Crumb Cake card layer were also punched with the Envelope Board punch, rounded to match the paint chip. Thanks so much for calling in today to view my card. Please feel free to comment if you like, as I love hearing from you. Have a great day. How was your day today? Mine was a little ordinary this morning, being dragged along for errands and a trip to the Hardware store. You all know how I like to amuse myself in a Hardware store? I go picking up Paint chips, not because I'm fond of painting, but because I can stamp onto them for some quick but effective cards. Here is the card I've made today using the By the Tide stamp set. It's just a regular Dulux paint chip stamped with Stazon ink. Images are from the stamp set By the Tide. The cardstock is Crumb Cake and Basic Black. with Stazon Black ink. The greeting is from the Six Sided Sampler stamp set and it's been elegantly finished with a piece of retired Satin ribbon. Here is the closeup view for you. I love how quickly this came together, and that I can actually enjoy a trip to the Hardware store imagining what I can do with these paint ships next. 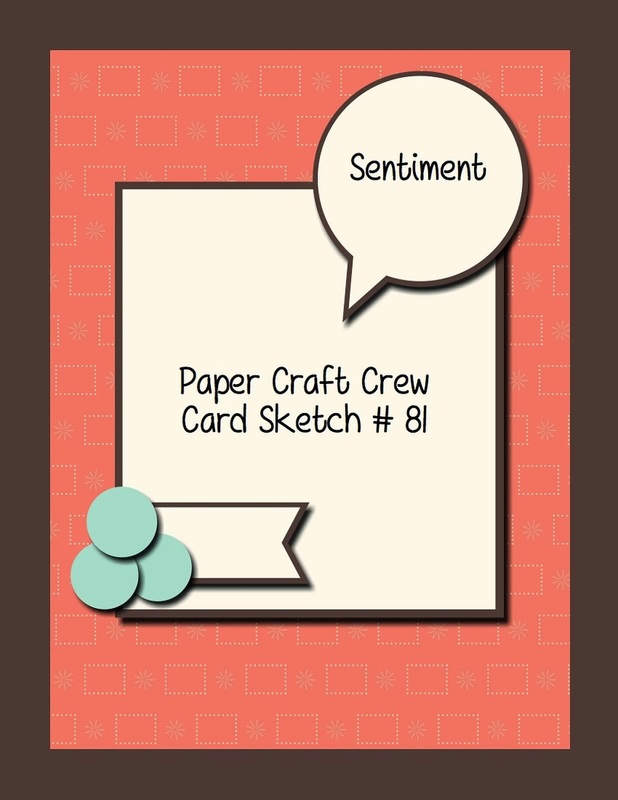 As it's Wednesday today's post is for the Paper Craft Crew Sketch Challenge. The sketch is below. Well, I've turned the sketch and slightly altered some of the placement of the components of this sketch for my 90th Birthday Masculine Card which I need for this weekend. It's an Uncle's Birthday and we're heading off to see family for this event. Here's what I did with the sketch. This card features Hardwood background stamp, Another Good Year and Memorable Moments for the number 90. The base of my card is Basic Gray and the Wood Panels are stamped Smoky Slate stamped with same ink. The ribbon and Accents are Cherry Cobbler . Here is a closer look. Don't forget to go and check out what our other talented designers have made for you this week at The Paper Craft Crew Sketch challenge. We would love to see what you come up with. Happy Tuesday to you. Today the weather has been quite pleasant. A little cooler because of the rain we've had overnight. It was a great day to catch up on my domestic duties and get some paper crafting done. I hope you're enjoying your day as well. My card today uses the stamp set Perfect Pennants for the Good Thoughts sentiment. I've cut and layered this with the Chalk Talk and Deco Label framelits on a monochromatic colour pallet. The cardstock used is Pool Party, Bermuda Bay and Whisper White. I've embossed the Bermuda Bay background with the Mosaic Embossing folder and layered it with a paper doily as a base for the Chalk Talk tag. The card has also been adorned with butterflies from the Papillon Potpourri stamp set. Here is a closer look. I've also added some Pool Party seam binding to the top of the tag and some Basic Rhinestones finish off the butterflies. Inks used for stamping were Pool Party and Bermuda Bay. February seems to be the Birthday month and in fact we have a couple this week that I need cards for. Today's card is a Birthday card which I've made for one of my daughter's friends for an upcoming party. Here is the picture below. I've used the large Birthday greeting from the Stamp set another great year as the main feature and fussy cut it out layering it onto some banners. The patterned paper is from the pack Winter Frost and the cardstock is Bermuda Bay, Whisper White, Coastal Cabana and Silver Glimmer. I've used the Petite Petals stamp set and matching punch for one little flower and the Beautiful Wings die for some butterflies. Closeup of the detail is shown here. I'm happy with the sparkle here. The whole combo is quite pretty. I hope the Birthday Girl likes it too. If you would like any further information, please don't hesitate to ask. Have a wonderful day. How is your weekend going? Mine's almost over, but I must say we've crambed in a fair bit. The nice thing is also the light rain we've had overnight and all morning. This is a very quick post tonight because I'm running so late with my card. I left it till the last minute again, after we had dinner. Today I've made a card using up some scraps off my desk. It's good to do that from time to time. The stamp set used is Happy Watercolor (note the US spelling). I've used the Chalk Talk framelits to create my tag for the stamped image and the new Arrow Textured embossing folder. The greeting comes from the set Petite Pairs. My cardstock is Crisp Cantaloupe, Whisper White and Smoky Slate. Here's a closer look at the tag. Thanks for calling in to see my card. Have a great day. Welcome relief today with some showers happening overnight and today. I know, it's been a long time coming and a long hot dry Summer here. We are truly enjoying the change. Today's card was inspired by my good friend and fellow SU Demonstrator Vicki. We do a monthly swap with each other and she sent me this really cool card which I had admired online. Just follow the link to see the original card and post. CASE means copy and share everything. When I saw her card, I knew I wanted to make one of my own, just like it and I actually taught this card at class today. It was the favourite card of the 3 we made. Thanks Vicki. Sending Good Thoughts - another quick card. I'm here from the sunny, hot, humid Sunshine Coast today. No storms, no rain as yet even though I've been doing a rain dance, lol. Here's a cool card to cool us off. What I mean is its a card in some cooling colours. I'll let you be the judge of whether this is cool or not. I've used the Flower Garden embossing folder and the Perfect Pennants stamp set mounted on a tag made with the Scallop Tag Topper punch. The card would not be complete without the butterfly from the Papillon Potpourri stamp set. The cardstock used is Bermuda Bay, Coastal Cabana and Whisper White. Here's a closer look at the tag. This card was certainly a quick one. Thanks for calling in to see it. Have a great day. How are you today? I am hot. I wish it would rain. Where are those storms they've been predicting. It's been so hot and muggy here in our neck of the woods. I have the air-con running now, as it has been for most of the last few days. Lets get of the subject of weather and onto today's card. I saw a card on Pinterest which I loved and decided I would create my own version of it. The layout is from Viva La Verve and my card was inspired by the work of Joanna Hooper. This is a closeup of my card to show the stamped image from the Peaceful Petals stamp set which I've coloured with markers and blender pens. The cardstock used is Wisteria Wonder, Pool Party, Regal rose and Whisper White. The greeting comes from the stamp set called Sweet Essentials. I've used the Gold Patterned Vellum over the Wisteria card to form an elegant background. This is the full view of the card. I think its a pretty colour combination. Here is the sketch Here's my take on the sketch I've used several stamps sets here including Just Sayin', Hardwood background, En Francais background and Petal Parade (SAB). The Cardstock used is Coastal Cabana, Crumb Cake, Wisteria Wonder and Whisper White. I've added some butterflies cut with the Beautiful Wings die and also used the Boho Blossom and small circle punch to create some little flowers. Here's a closeup so you can see the details better. Thanks for calling in to see today's card for the Paper Craft Crew. We would love for you to join in with our challenge and see what you create. For more inspiration, pop over and see what the other talented designers have shared. It's my youngest daughters' birthday today. My Baby Girl is now 13 and I have the card I've just created to show you. She hasn't seen it yet, as she's away at Band Camp and is celebrating her birthday while there with her friends. We'll celebrate after we pick her up. I've created this Label Topper Easel card using some Sale-a-bration papers and the stamps Another Great Year and Memorable Moments. The cardstock used here is Island Indigo, Pool Party, Basic Black, Whisper White and Crisp Cantaloupe. I've also used some punches, Artisan & Decorative Labels plus 1 " circle punch, small heart punch and Dotted Border punch. Here is a closer looker at the label. Another Sale-a-bration product I've used on this card is the Decorative Dots embossing folder. It goes with the dot print paper used on the base. I hope she likes this card. It will definitely be unique. It's been another very warm day on the Sunshine Coast here, above average temps and extremely humid. The predicted storms building are not due until tomorrow. Once again it was an air-con day. Today's card is a little different to my regular style. I've used a Vintage background stamp called Postcard which I've overstamped for a collage effect with En Francais background stamp and Peaceful Petals. The greeting used here is from the set called Blooming with Kindness. The cardstock used here is Basic Black, Regal Rose and Whisper White. I've made a small rosette to add to the card plus a little crochet trim, some pearls and a little butterfly from the Beautiful Wings die. The Regal rose card has been embossed with the Lacy Brocade embossing folder which has been inked with Crumb Cake on the inside. Here is the closeup. I've used blender pens to pick up the ink and colour the flowers. Hope you're having a fantastic weekend. It's been a little warm in our area today. Definately air-cond weather today. It was unbearable outside. Apart from the normal running around for the girls today, I've managed to make a card with the new Spiral flower die. It makes quite a lovely rose. I think you would get better results with a little more practice, however this is my first one. The background grey card has been embossed with the Lacy Brocade embossing folder and the Label Framelit shaped layer has been stamped with the swirl from the Everything Eleanor stamp set. I've kept the card very simple, only adding a greeting and butterfly. The cardstock is Strawberry Slush, Basic Gray, Soft Sky and Whisper White. Here is a closer look at the flower. Thanks for stopping by. Hope you have a lovely day. Today my youngest daughter has a party to attend. It's a joint 13th Birthday party for 2 girls Laura and Hayley. We've bought them similar presents and I wanted to also make them similar cards. Although Anna was not really in favour of that idea this is what I've made. I've combined stamps from different sets here including Perfect Pennants, Memorable Moments and Another Great Year to create these Window topped Centre Easel style cards. The patterned paper used on the card is from the Watercolour Wonder pack. They are essentially the same card with some mix and match of the colours. The next photo shows the opening. I've used cardstock of Island Indigo, Whisper White, Crisp Cantaloupe and Garden green with Window & Bitty Banner Framelits and x-large Oval , Decorative Label punch circle punches. I've taken a picture side on so you can see how they sit. I've also taken individual pictures of the cards below. I have a quick post today. Are you having a lovely Valentine's Day? Best wishes to you for whatever your plans happen to be. To celebrate the day I've made another card going with the Love theme using the expressions thinlits and gold foil. Here is the closeup. The gold love is sitting on a diecut Scalloped heart from retired paper pack called More Amore and that in turn is stuck onto some layered Label Framelits. Here is the whole card. This style of card is called a Centre topper Easel. The cardstock used is Raspberry ripple and Very Vanilla with Gold foil for the accents. The side on view of the card is below. Have a fantastic Valentine's day and thanks for stopping by.